Just when I thought spring is on it’s way…BAM! We get hit with a major snow storm. I was really hoping the spring like weather we had last week was here to stay, but it IS February in Chicagoland….it was bound to snow again. It’s Kim here on the cold and very snowy Friday to bring you the new goodies for this week’s release at Gotta Pixel and A Cherry On Top. 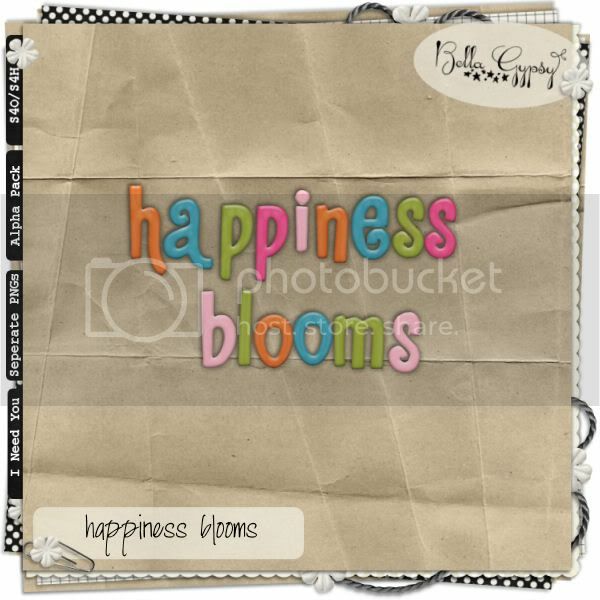 To help remind all of us that spring IS on its way, Bella Gypsy is releasing this gorgeous new kit today called Happiness Blooms. I think this has to be one of my favorite BG kits! The papers are gorgeous and look at all those flowers! YAY! Here are some glitter papers that coordinate with the kit! I am making it short and sweet this week! I am heading out for a scrapping weekend….THREE days of ME time but before I go I have a little freebie for you! Click HERE for your download link or you can click on the preview! Enjoy!